Editor’s note: livehealthy.ae had its first viral story with Melanie Swan’s piece, “Gymnastics, contortion and social Media are changing yoga — and not in a good way.” Not only did the story resonate with people around the world, it prompted many comments and emails from new readers. One of the main interviews was Simon Borg-Olivier, a well-respected, well-known and long-time yoga teacher and partner in Yoga Synergy, a yoga school in Sydney. 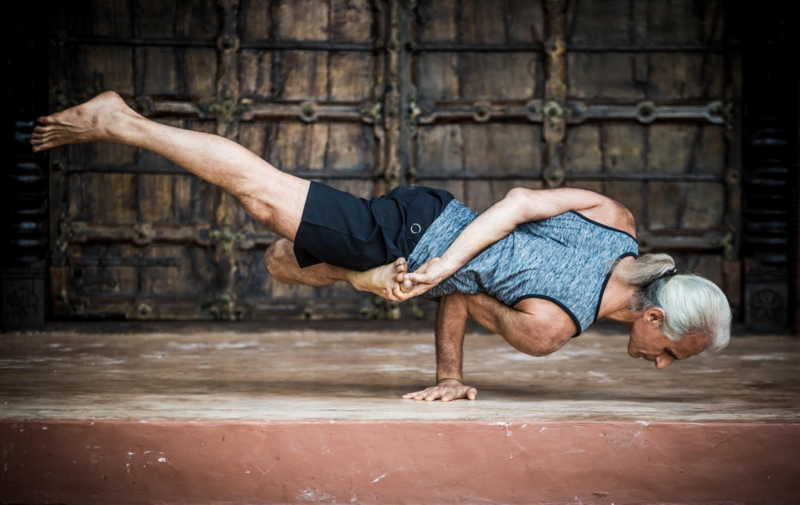 Here, Borg-Olivier, who was in the UAE in April offering workshops in both Abu Dhabi and Dubai, elaborates on the article itself, the current state of yoga and how to teach and practice safely and responsibly. Firstly, I did not write the article, but was one of three people who were interviewed for the article. Secondly, although the main photo is of me balancing on one hand in a bound lotus, I didn’t actually select that photo, and I was not really aware of the content and general feeling of the article when the photo was chosen. Otherwise I may have suggested using another photo. This is because it may appear that, and some people have actually commented that, I am being hypocritical by demonstrating an advanced posture. Others actually commented on my photograph not reflecting yoga, without realizing that I was one of the people speaking against this sort of thing in the article. The article suggests that much of what is being portrayed as yoga on the internet is physically similar to contortion or gymnastics. I believe this is true. I agree that this can make some people erroneously believe that it is only possible to achieve yoga if you can do these types of postures, and that perhaps achieving these types of postures is an important aspect of yoga. Such beliefs are of course not true, and application of these beliefs can have negative results on many levels. I have no problems with anyone doing good gymnastics or contortion, as it can be really fun. But for most normal adults it is really difficult to do challenging gymnastics or contortion without risking damage in the short-term or long-term future on a physical, physiological and/or mental level. However, it is possible for some people to do advanced contortion or gymnastics and still be in yoga. But for this to be possible their practice needs to enhance, as opposed to reduce, health, well-being and longevity on a physical, physiological and/or mental level. I believe that yoga can be obtained in any posture, movement or activity. Yoga, which literally means union, has many facets on many levels, including physical, emotional and social levels. But to me the most important principle of yoga is to recognize that everything is connected as one, and to treat everything and everyone as one, by making loving and balanced connections within yourself and in your life. One personal and physical example — that I feel reflects more accurately what yoga is — is to be able to do a stressful activity while still feeling relaxed and engendering well-being on all levels. Conversely, I feel less yoga is reflected if you are being stressed out while doing a stressful activity. Intense exercises such as gymnastics and contortion can be physiologically stressful and/or physically dangerous if performed inappropriately and/or if practiced by someone who is not suitably qualified to do so. Readers objected to the photo of Borg-Olivier doing one-handed bound-lotus peacock, when the story was about the rise — and possible dangers inherent in — contortion. The posture I am shown doing in the article (the one-handed bound-lotus peacock), which is a fairly advanced practice to master, is actually very relaxing for me and very therapeutic on many levels. I use my entire body weight to press my elbow into my very relaxed abdomen. I thus “massage” my internal organs in a way that enhances digestive, immune and hormone function, while releasing my psoas muscle and lower back. Practicing this posture in this way, I can talk and breathe naturally. So even though it is a fairly advanced posture, I am doing it in a very relaxing way, and except for doing a relatively simple bound lotus, it is not even a very contorted posture. However, I could not have done this posture in a relaxed, safe, and effective manner without having done a regular incremental practice over five decades, from an early age, under the supervision of the many excellent teachers I have had. I totally respect the writer of the article and I regard her as my friend, but I fully agree with what many people who know me well said, regarding how the limited number of my quotes in the article have been taken out of context, and therefore the article does not fully or correctly represent my thoughts on this subject. The interview for the article was done a long time ago, and although I may have said, for example, that there are people who “are teaching nonsense yoga,” which, if said without context, might offend some people, there are lots of other things I said that were not included in the article, that would have made what I said clearer, more rational and sound less offensive. I would like to clarify some of those things here. All styles of physical yoga, and all types of posture, movement and breathing exercises are valid in my books. But to suggest that all styles are valid for every person is not true. That is perhaps the most important thing I was trying to say. Also, I don’t consider any one exercise or instruction to be wrong or right. I believe everything can be correct in the right situation. In my decades of experience as an exercise-based physiotherapist, who has been observing the world of modern yoga over the last four decades, there are many problems with the way yoga is being represented in the modern era, both physically and philosophically. There are indeed people who teach and/or practice posture, movement and breathing in a way that ends up being potentially unhelpful, ineffective or even dangerous to bodies that are not really suited to these practices. And this may cause unintended damage on a physical, physiological, and/or mental level to the practitioner either at the time of practice or at some future date. There has been much written about this by other physiotherapists and doctors over the last 10 years, but this was something that had become obvious to me way back in the 1980s when, after 10 years of teaching yoga that I had learnt from Sri BKS Iyengar and other senior teachers, I realized that many physical problems that people came to yoga classes with were not addressed adequately, and were often made worse by some of the posture, movement and breathing exercises that are taught in modern physical yoga classes. I believe that the essence of the philosophy of yoga is not generally what is being represented by the physical practices of posture, movement and breathing that are being taught in many modern yoga classes. • potentially boring activities (like seated “meditation”) in an engaging, exciting and very beneficial way where my blood is flowing effortlessly. Now in principle this all sounds very lovely, but one may ask if it is physically possible to have a physical practice that is able to do what seems like two opposing things at the same time. QUESTION: Is it possible to get flexible without doing strong stretching? QUESTION: Is it possible to get strong without consciously tensing muscles and feeling tense? QUESTION: Is it possible to get improved blood flow and circulation without increasing heart rate? QUESTION: Is it possible to get more energy without having to breathe so much? I assure the reader that it is possible to do these seemingly opposing things, and that there is a relatively simple method to do them. But then one has to ask how can you do these things and what is this method? The answer to these questions is not straightforward. It is relatively simple to physically show and teach this method to people if you are with them, and this is exactly what I do in my live and online training. However, this method cannot be simply or clearly explained with words alone, especially in a few sentences of text, unless you have a comprehensive understanding of musculoskeletal anatomy, neurophysiology, cardiopulmonary physiology and psychology. Ideally to have this understanding you need to do the equivalent of a combined medical degree, a physiotherapy degree and a psychology degree. This level of knowledge cannot be obtained in 200 hours of training alone, or even in 1,000 hours. You need at least 10,000 hours to learn to achieve what has traditionally been considered the entry level for any serious physical practice that involves dealing with other human bodies, such as medicine, physiotherapy and psychology. This is also true for anyone learning any personal physical discipline such as martial arts, dance and physical yoga as they have been taught for many centuries. When I was learning from well-known masters such as Sri BKS Iyengar and Sri K Pattabhi Jois, we were told we needed at least a decade of serious training before we could teach anything. Most people teaching physical yoga in the world today simply do not possess sufficient knowledge to teach anything but the simplest practices without risking damage in students. Even today, even though I may occasionally demonstrate some advanced posture, movement or breathing, I always emphasize the prerequisites needed to safely perform these practices and point out that most normal adults simply don’t have these prerequisites. Then I mainly teach only the simplest and safest things in most of my classes. Rarely do I even teach inversions or complex breath-control, unless my students have achieved quite a proficient level. With a good understanding of anatomy and physiology, as well as the true philosophy of yoga, it is quite possible to teach and practice yoga using posture, movement and breathing, and have it totally in harmony with the principles of effective and health-giving exercise physiology and physiotherapy, as well as the most important teachings of the true philosyoga. When you apply these principles then it is quite possible to do a physical practice that makes you flexible, strong, healthy and fit, while feeling calm, peaceful and relaxed. To learn more about how to do this in practice, I invite you to read more of my blogs or join one of our live online training.